ADITYA HRIDAYAM MANTRA – The most powerful Mantra dedicated to Surya, the Sun God. This Mantra is widely suggested by Vedic Astrologers to overcome difficulties in life, caused by negative Karma. 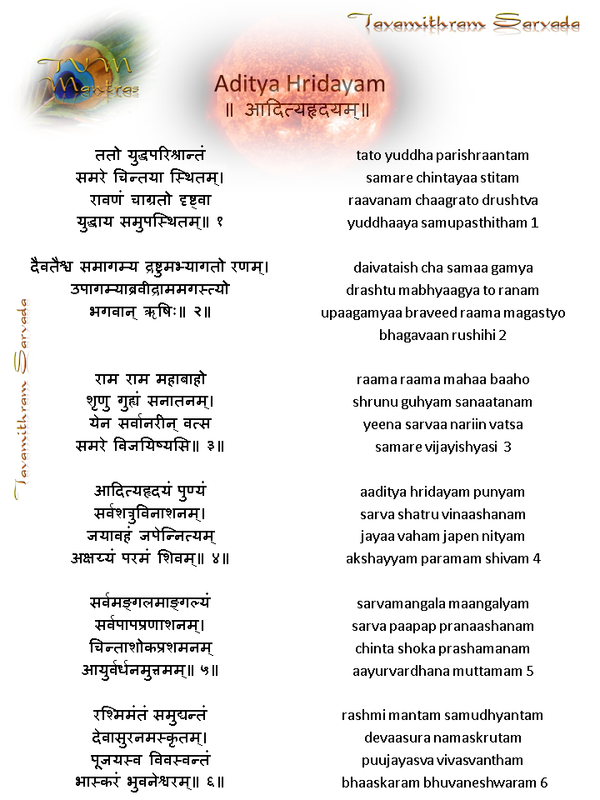 The Aditya Hridayam Mantra(m) is a hymn from the Valmiki Ramayana, dedicated to Surya or the Sun God. 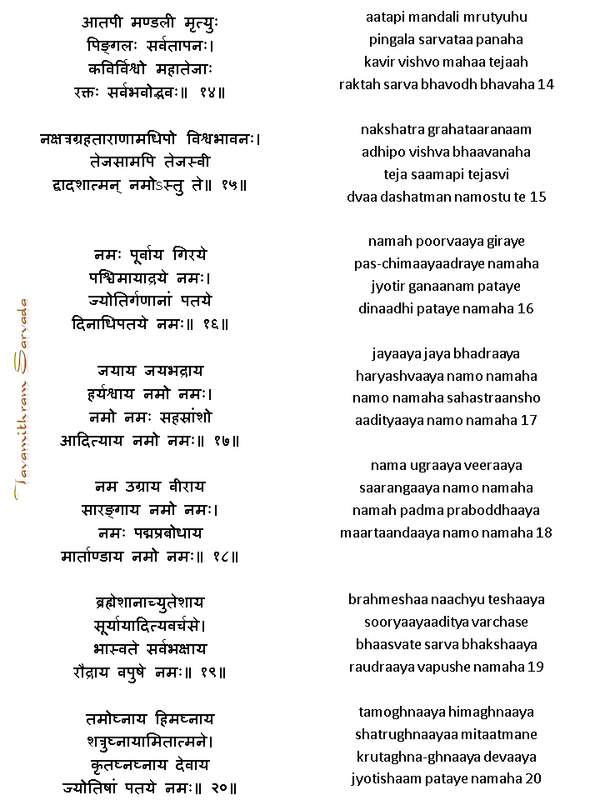 The entire Valmiki Ramayana contains over 14000 verses and is set to the ‘poetic metre’ – The Anushtup Chanda, where each line contains 8 syllables. Four such lines of 8 syllables make a verse. 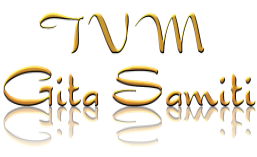 This Mantra provides immense energy when chanted facing the Sun early in the morning. It imparts focus, determination and positivity to people chanting it and helps them face challenges in their day to day life. When practised after a session of meditation, it augments the feeling of peace and well – being. The ‘evil character’ in Ramayana is Ravana, the powerful Asura King of Lanka who was a well read and highly talented man. His only negative qualities were arrogance, conceit and extreme egotism. These negative qualities in him finally led to his destruction. Bhagavan Shri Rama tried very hard to slay Ravana but the Asura King sprang back to life within moments every time Rama thought He had killed him. That is when the great Sage Agastya, went to Rama and instructed Him to recite the Aditya Hridayam Mantra. As per the instructions of the Sage, Rama recited the Mantra three times and destroyed Ravana. Ravana’s ten heads symbolise the many levels and layers of arrogance and conceit people have. When Rama cut one head, another one popped up. 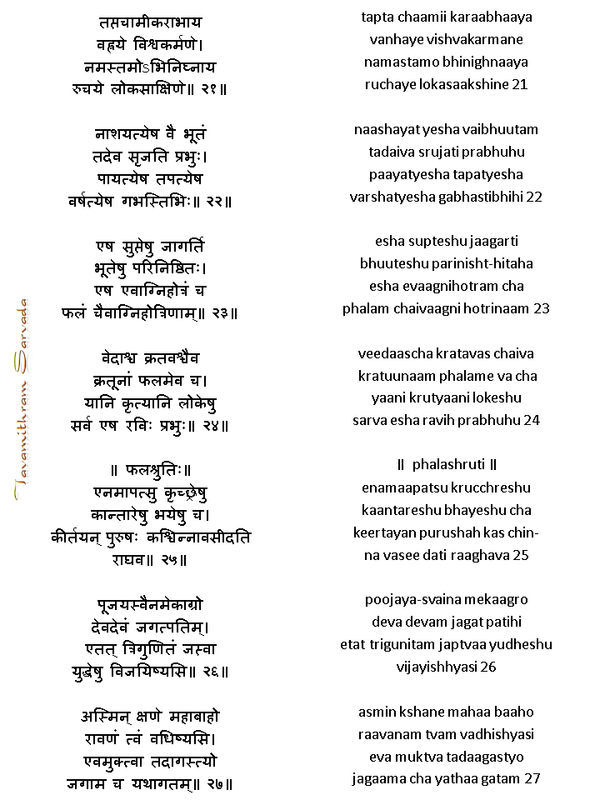 The magical and powerful Aditya Hridayam Mantra gave Rama the concentration and dedication required to destroy Ravana. Change always starts from within. Once the ‘Ravana’ in people is destroyed, they too can rise to much higher levels in life. By destroying Arrogance and Egotism which are manifestations of Negative Karma, one is able to connect better to the Higher Self. Shani or Saturn is also known as Raviputra which means the son of the Sun. Therefore during periods of Saturn, such as Sadé Sati or Dashas of Shani (Saturn), it would be highly advisable to learn the Aditya Hridayam Mantra by heart and recite it every morning. May Aditya Bhagavan fill your life with high energy and brilliance.